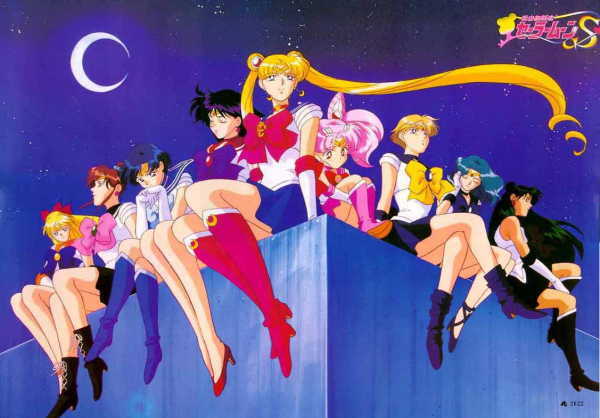 This is series that follows the R Series of sailor moon. You can see small bits and previews of the first episode in the last dubbed episode of R. The main reason this series was not dubbed was becuase two of the new scouts introduced in this series are lesbians. Because of the fact this series was orignally geared to little girls, the dubbing company, DiC, decided to stop dubbing the series just before the S series began. The S Series introduces the 4 Scouts of the Outer Solar System. 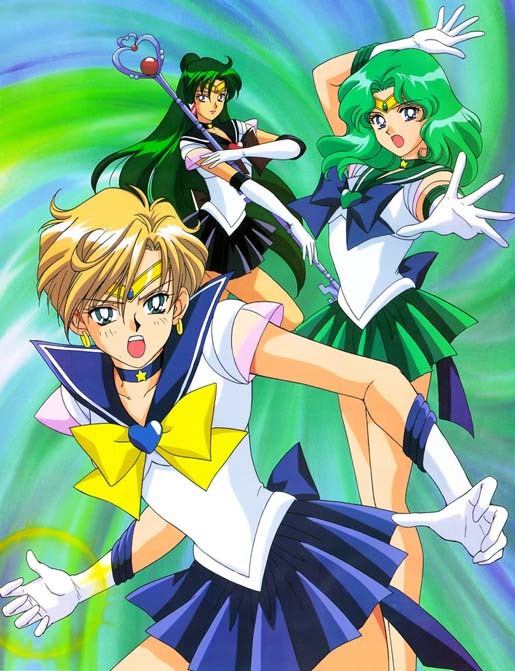 Sailor Neptune and Sailor Uranus are the lesbians. 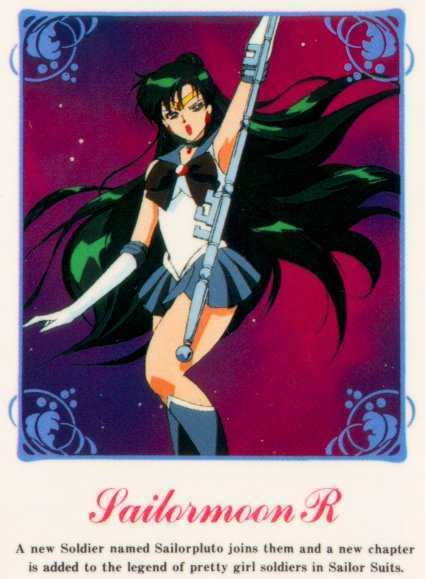 Sailor Pluto was introduced as Luna-P in the R Series, but this series uses much more of her at its later half. 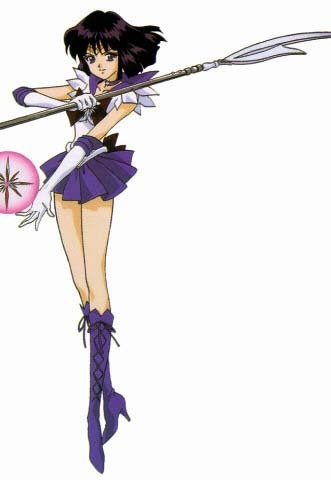 And at the end, Sailor Saturn is introduced. Below you will find pictures of these soldiers, just so you know what they look like. As always, please feel free to use the pics for your webpages or personal galleries. After the galleries, which are in thumbnail form you have to click on, you will find a synopsis which goes into more detail about the series. HOWEVER, if you want to order this series subbed and wish to see for yourself, DO NOT GO DOWN THERE! It contains material that may spoil the series for you. Well, enjoy! 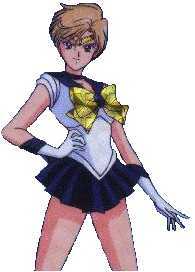 Sailor Uranus/Haruka - The soldier of Wind and Eartth, Haruka is Sailor Uranus. 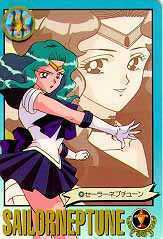 She is very headstrong and can be stubborn, especially when it comes to working with the Inner Senshi. Haruka also dresses like a man. 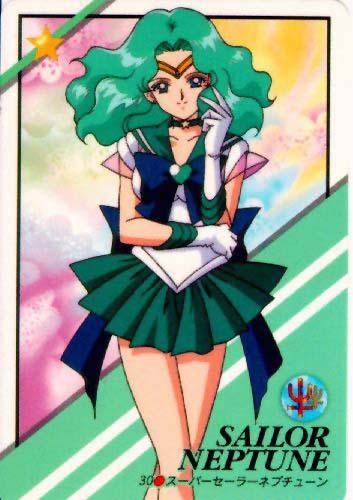 She and Michiru share a strong love, a love which has a lot of depth to it and helps make the series. She tends to be the "man" of the couple, and in the beginning of the series, Minako and Usagi actually mistake her for a guy. 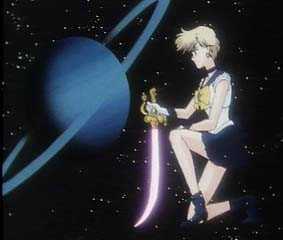 Sailor Uranus' attack is World Shaking, which sends a powerful orb of energy at her opponent that rips up the ground. 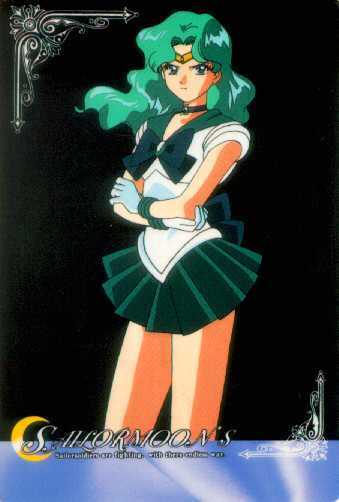 Sailor Neptune/Michiru - The soldier of the Sea, Michiru is Sailor Neptune. She tends to be very kind in her nature, and is gentle. She is gifted as well. She's an accomplished violinist, artist, and an all around cultured woman. She and Haruka share a strong love, so strong that many of their entrances are done as a pair, and rose petals blow past them while a violin plays. 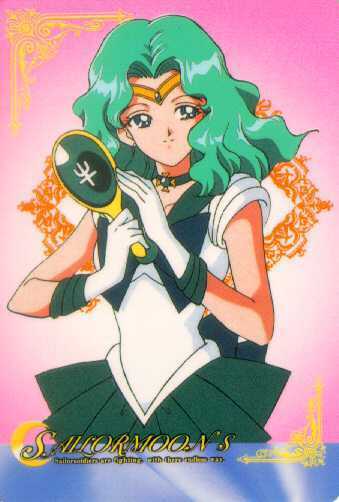 Sailor Neptune's attack is Deep Submerge, which sends an orb of water at the opponent and nearly drowns them. 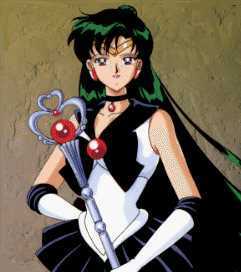 Sailor Pluto/Setsuna Meio - The soldier of Time, Setsuna is Sailor Pluto. 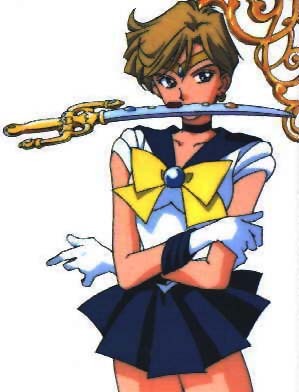 Setsuna actually first appeared in the R Series, as Chibiusa's guardian, Luna-P, as the gaurdian of the Time. However, her role in the series was extremely small, and the S series marks her first big role. She makes the scene in the middle of the series. Setsuna remains a mysterious woman, but she shares a sort of "Aunt" relationship with Chibiusa, who affectionately refers to her a Pu. 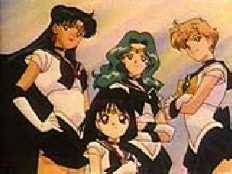 Sailor Pluto seems to be the tactician of the Outer Senshi. 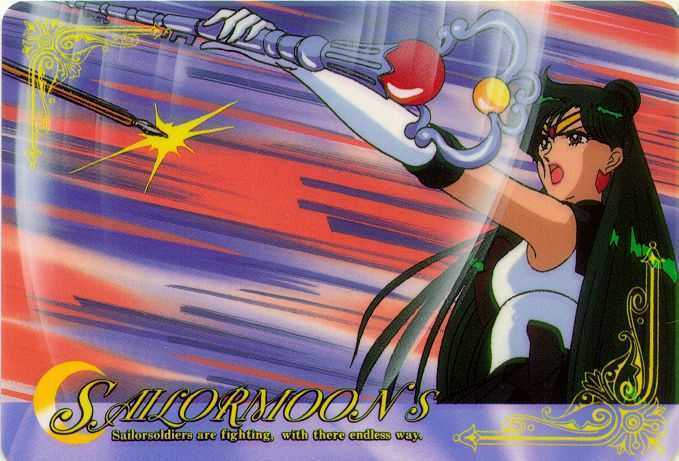 Sailor Pluto's attack is Dead Scream, which sends an orb of dark energy at her opponent. Sailor Saturn - The soldier of Death and Rebirth. While if you've seen parts of this series, you can probably already tell who Saturn really is, her identity is left out here for all those who haven't. 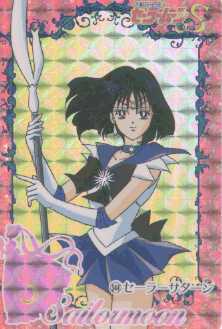 Sailor Saturn's special power is the ability to sacrifice herself to destroy her enemy, then be reborn as a baby again. When another evil source approaches Earth, the baby matures quickly to the state Sailor Saturn was in before she sacrificed herself. Once more, I'm giving you fair warning that this preview may contain spoilers. The enemies of the S series is the organization "Death Busters", who is lead by Dr. Tomoe and its special operatives are known as "Witches 5". The monsters the Death Busters employ are called Daimons, and they are after the pure crystal hearts of people in Tokyo. They are after the 3 Talismans which are hidden in the pure crystal hearts of 3 people, for when the 3 Talismans are found, the Sacred Cup will appear, and they will rule the world with its awesome power. That's where the Sailor Scouts come in. They save each victim as the story goes on, like they do in other series. Except this time, there's a minor complication. 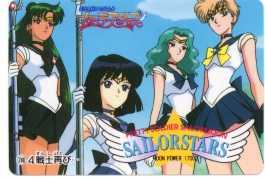 Two Sailor Scouts of the Outer Solar System appear, and they are Sailor Uranus and Sailor Neptune. They are also after the Talismans, to prevent the Death Busters from destroying the world. However, they are also not afraid of letting people die, which is what will happen if their heart turns into a Talisman and is taken away from them. 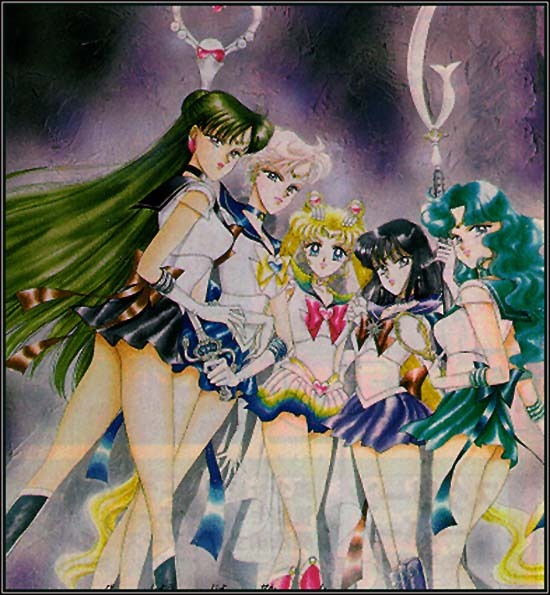 About the same time, Usagi and her friends meet two romanically involved women named Haruka and Michiru. And, in the grand tradition of Sailor Moon, Usagi and her friends don't realize that Haruka and Michiru are really Uranus and Neptune. 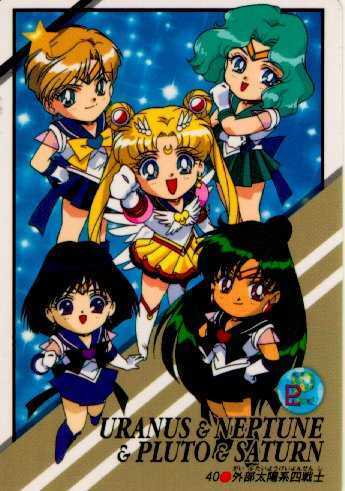 Also, Haruka and Michiru don't realize Usagi and the others are Sailor Moon and the scouts. Then, about in the middle of the series, the 7 people are forced to transform in front of one another, and everyone's shocked. 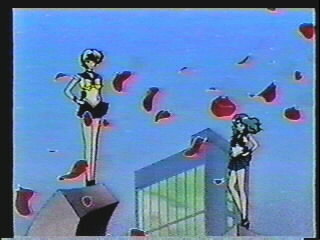 Immediately after this, Michiru and Haruka get a call from the enemy, telling them to come to the Marine Cathedral, because they know the holders of the talismans. Uranus and Neptune go, and then the big surprise is revealed that Uranus and Neptune are also the holders of two of the talismans. The enemy takes the talismans during a poignant love-and-deaths scene where Usagi and the others arrive a tad bit too late. (By now, Chibiusa is in the picture, having come back from the 30th century to train under Usagi as Sailor Chibimoon) Usagi chases after the Witch that has the talismans, (the others fell victim to a trap involving sticky glue) and finds that her attack is of no use against the Witch. That's when a green-haired woman named Setsuna Meio arrives on the scene, who's been watching the entire episode for some reason. 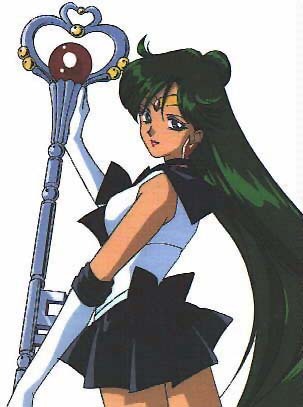 She reveals her true identity, that of Sailor Pluto! 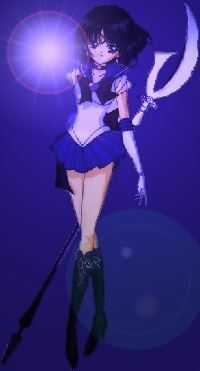 She is the holder of the third talisman, and she revives Neptune and Uranus and brings the 3 talismans together. The Sacred Cup appears, and after a chase with the Witch, Sailor Moon touches the cup and transforms into Super Sailor Moon, who looks a bit like a butterfly now with a rainbow colored skirt. From this point, the search is now on for the Messiahs of the Sacred Cup. There's two, one of Light, and one of Dark. To find out more, watch the series. But in case you looked at the galary and wondered who the heck is the girl with the dark short hair, that's Sailor Saturn, the Soldier of Destruction and Rebirth. Her real name is Hotaru Tomoe... yeah... the daughter of Dr. Tomoe, leader of the Death Busters!